In the Florence Henderson episode, for the first of countless times, Piggy used one of the only French words she truly knows–namely (and fittingly) “Moi”. In later episodes, she’ll claim to actually understand French, in order to seem more cultured, while actually knowing little-to-none. In this second instance, however, she doesn’t actively claim to know it but does experience extreme, helpless arousal at Charles Aznavour whispering it in her ear. 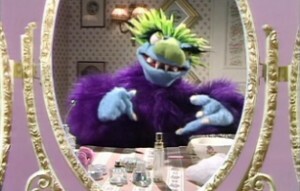 She erotically sighs and gasps for breath (oh, look, another example of adult-oriented Muppet humor! ), as he demonstrates for Kermit how speaking French always gets the ladies going, and sometimes even more so when they don’t know what he’s actually saying, for in fact, the “deeply passionate” words he’s whispering to Piggy are actually, “Your oil filter has a leak…” and the telephone number for the Paris garbage dump. Now, that isn’t to say that Piggy, at this point in her life, isn’t pretending to understand the language. One could easily assume that she expects that it goes without saying. It’s also possible that she’s worried about directly making that claim to a Frenchman. Later on, in the fifth season, her worst fears are realized when flautist Jean-Pierre Rampal expects her to be able to carry on a fluent conversation with him. Putting that aside, however, following up on that one brief “moi,” this interaction helps cement one of Piggy’s most crucial character elements, not to mention carrying through with her outrageous flirting with male guest stars (established in the Jim Nabors episode), despite her demands that Kermit not do the same with other women. 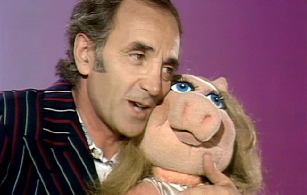 It also has a nice payoff in which Aznavour actually falls for Piggy, Kermit quips that “one man’s poison is another man’s bacon!,” and Piggy returns and rightfully karate chops the frog. “Barbarian,” she calls him, as she marches off. Aznavour and Mildred dance in “The Old Fashioned Way”. Other than that, Aznavour really only does his two musical numbers–the first a song of his called “The Old-Fashioned Way,” which makes for a rather dull ballroom dance with Mildred and a number of creepy full-bodied human Muppets (cut from the DVD due to music rights but available to watch here), the second, the classic “Inch Worm” by Frank Loesser, from the Danny Kaye movie musical, Hans Christian Andersen, a sweet song but not a remarkable rendition, other than the appearance of a cute little Muppet worm who looks like he could be Oscar’s worm, Smiley’s, cousin–and a cute bit where Hilda serves him a loaf of bread that she claims to be French bread, and he tells her it isn’t but is proven wrong when the bread opens it mouth and speaks French in a perfect accent. At least there’s one Muppet he can converse with in his native tongue! Meanwhile, as per usual, the episode’s “plot” has nothing to do with the guest, and is woefully underdeveloped. On the plus side, it actually springs from an interesting place. After not being on stage for a “couple of shows,” Gonzo goes to Kermit to ask why he hasn’t been featured. 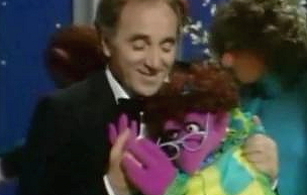 In actuality, by this point, it’s been more than a couple, as the last time he’s even spoken was in the Joel Grey episode, which was about 7 weeks ago, at least going by production order (to be fair, since the episodes aired in a completely different order, it’s possible there wasn’t as long a gap between Gonzo appearances at least on some of the stations; on the other hand, the gap could have been even bigger for some, as each syndicated network chose its own order! ), but it’s fascinating to see the writers actually basically acknowledging, in a meta way, that they don’t have any idea what to do with Gonzo. Kermit tells him his act isn’t working, which is true both on the show and the show-within-the-show. KERMIT: …I can give you my ear for a moment. GONZO: What would I do with your ear? GONZO: I don’t play for the masses! I’m an artist! KERMIT: Then you should’ve gotten my Van Gogh joke. And there’s also some funny stuff in the debate sketch, in which he keeps taking a string of various idioms in a row completely literally, but the problem is that–as I discussed in the Florence Henderson debate sketch–it entirely sacrifices character for humor. Gonzo is made to be less intelligent not because it’s organic to his character but because it scores some easy laughs, and as I’ve said before, this was a negative effect of Jack Burns, the head writer of the time, being a veteran variety show writer but not a character writer. Furthermore, a lot of his comedy was extremely creaky by that point and more suited to the Vaudeville era. Of course, the Muppets would use deliberately lame humor later, as well, but more often than not, there was more of a knowing wink by that point, and it wasn’t just wall-to-wall groaners, as it often was in the first season. It will be interesting to see if Gonzo does end up improving before the second season, when he’ll be the daredevil performer we know and love, or if he ends up being shelved again until that point, since I don’t recall. 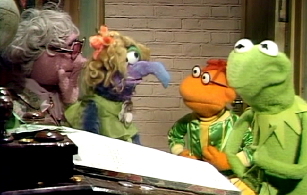 –One of the episode’s best moments is its rendition of West Side Story‘s “I Feel Pretty,” a perfect Muppety switcheroo reinterpretation of a classic song, which I would probably discuss in greater depth…except I already did, as it’s an exact recreation of a bit the Muppets did on Julie on Sesame Street 3 years earlier! –This episode features the first time that Frank Oz plays Nurse Piggy in a Veterinarians Hospital sketch! Unfortunately, it’s not a particularly notable one other than that, but that alone is pretty major. In fact, the only time Richard Hunt plays Piggy in this entire episode is her quick line in At the Dance, indicating that Oz’s version of her is definitely taking the spotlight by this point. All of Piggy’s real character stuff is going to him, as is now even most of the side bits. –This week also marks the first time that a guest star doesn’t appear in the debate sketch, as well as the first time that Sam the Eagle actually gets to take part in a sketch, versus simply introducing Wayne and Wanda. He spends the majority of the time being beleagured by Gonzo’s stupidity. –Although Fozzie doesn’t really get the upper hand in his comedy sketch this week, as not only do Statler and Waldorf heckle him but they actually take over his act all together, he does get a bit of karmic justice when the two old codgers accidentally begin to heckle each other! And thus the circle of life is complete.